Walking distance to Walmart, PNC music pavilion, Cinemas, and more! 5 minutes away from the Charlotte Speedway (NASCAR race track) Only 15 minutes away from downtown. Gated community, conveniently located. We love hosting guests from all over the world! Amazing place, location and care. Everything about this stay exceeded expectation. It is the definition of too good to be true, but it is true! If you have any opportunity to stay here do so, it is beyond worth it. Rachel and Jorge are the best hosts I have ever delt with and are through, thoughtful and very quick to respond and accommodate you in any way. Great hosts! My employees said it’s the best AirBnB they’ve stayed at! We travel all the time for work! Thank you! Jorge and Rachel were very gracious hosts. Their place was very clean and comfortable. Jorge & Rachel are really great host. Their home is so cozy and it has its own unique touch. They provided a wonderful breakfast and made us feel at home. I would definitely recommend staying here. Quick and easy communication. Very nice bed and space. Super clean. Would definitely stay again. Very nice folks the place was clean and quiet! This listing is for the master room with a private master bath. The room has a queen size bed, walk in closet and drawers for clothes if needed. You can access the full kitchen, laundry, living room and dining room. There are towels, soap and shampoo provided as well. Beautiful, quiet community and very safe. The community has a HOA which every guest and homeowner has to obey and respect. The atmosphere in this community is very calm and quiet with friendly, helpful neighbors.There are two churches around and a lot of restaurants to choose from that are only minutes away. Close to 485 and I-85, this location has fast food, grocery stores, as well as salons and spas that are convenient to this location. Adrian was an amazing host. The location was great. The place was very quiet at times. Thanks for everything. I hope the best for you kid. Overall the place is nice if you need something modern and clean and has good amenities and the people who own it are very friendly and happy to answer any questions you have about the area.would recommend for a couple or someone single. Super liked our stay at Adrian's place. He has been very gentle and provided all the amenities we needed. The place was clean, quite and spacious. Thanks for being such a wonderful host, Adrian! You take care. I had a great stay at Adrian & Jennifer`s Air BnB ! The location and room were great. They are good people ! Adrian and Jennifer both made my move to Charlotte so much easier. The location is perfect and the room and townhouse was kept clean. Would most def recommend them as they are great host! **please read before booking** ** Utilities, WiFi, laundry included** Our house has a little to much room In the living area so we decided to put up a temporary room. It has a twin bed, chest drawer. It can be used for quick stays or long term. The room doesn’t have any walls we put up sliding cotton drapes and it works amazingly. Please park only on Hanberry Street or the drive way if its opened. Great hosts! Their dog, Diesel, was an added perk. Your getaway will be in luxury 3 level townhouse in the sprawling yet distinct Mallard Lake Subdivision. Your private bedroom is on the ground level and features a walk out terrace and garden. You may choose to enter from the main entrance or use the garden entrance. Your private bathroom has a full bath/shower vanity and exterior window. We are avid tennis players, so we'll be happy to help you find courts/partners. This place is quiet, private and cozy, entrance on first floor ,no stairs and private bathroom. We are super close to Charlotte Motor Speedway, PNC Pavilion, UNCC is 10 minutes and Uptown is 20 minutes. Excellent location with a clean room. Although this is a shared room, it truly is private and on its own level with a private bath and patio. We loved drinking coffee in the morning while relaxing! Couldn’t have asked for a better stay! Janet and Anne are the epitome of super hosts. They have always got a clean house and go above and beyond to make their guests feel at home. Wish I had longer to enjoy the pleasure of Janet & Ann's place. Convenient to so much, and pleasant staying in. I could not ask for more. My home away from home in Charlotte. Janet'sce is nice, private and clean! You pretty much have the bottom first floor to yourself. There is no kitchen amenities however having the bottom floor and a private bathroom to yourself may make up from that. If you need a place to sleep and relax for a couple of nights, this is it for you! I would stay again whenever I can't get a chance! I highly recommend it! Janet and Ann were very welcoming, the room is very comfortable. Nr: UNC,PNC Pavill, Nascar Spdwy, 15mins to Uptwn. We have a 4 bedroom house within 5 minutes from UNC Charlotte and around 15-20 minutes from Uptown Charlotte. Close to really everything! Bedroom comes with double bed with two side tables, one couch is in the room. 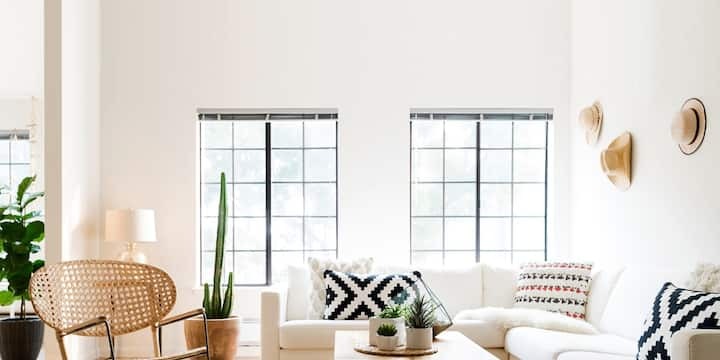 Two windows bring natural light into the room for comfort and a chill vibe! There are 4 people living in the home at this time and 2 puppies! But you will have your own space upstairs. We also have an office you can work in along with 2 different living rooms (one including a projector screen) We welcome anyone and everyone into our home with open arms! The neighborhood is very quiet! Mostly older people and families. We are right near a Food Lion, gas station, and plenty of food choices! 1500 square feet. Welcome to Charlotte. This is a comfortable place to relax and access many different areas of Charlotte. Grab the Lightrail at UNCC to Uptown! Very close to UNC Charlotte, Concord Speedway, Harrisburg. Exit 33 on 485. Modern furniture, spacious apartment, quiet location. Lots of amenities. 20 minutes to Charlotte Douglass Airport. Each room has a TV, desk and closet space. Full access to kitchen, living room, work out facilities, and pool (in season). This is a quiet neighborhood close to 485 (exit 33) and 85. Right off University City Blvd this is close to IKEA, UNCC, Charlotte Motor speedway Easy to get to light rail. We couldn’t have been happier with our stay at Michael’s place! Excellent communication, very clean space, comfy bed, and nice effort put into providing finishing touches around the apartment (snacks, toiletries, towels, etc). Highly recommend this place to anyone! Michael's comfortable, Zen space was a perfect respite in the midst of a hectic work trip. Every detail, down to thoughtful book choices, motion-activated nightlights, healthy snacks, and detailed instructions, the stay was phenomenal. I'll certainly be staying again when I'm back in the area! An awesome place! Located very close to UNCC. Michael and Liesil are some of the sweetest people you could ever meet. Great energy, fun to hang with, and their home is beautiful and very welcoming. I couldn’t have ended up in a better place. I was able to get a lot of work done which rarely happens when traveling but their home is peaceful enough. They cooked an awesome breakfast and dinner for myself and their other guest. I made great connections while there and I hope to stay with them again soon. Michael’s place is great. Very close to UNC Charlotte. I felt at home all the time. He has everything in his apartment. He is an amazing host. Michael is an amazing host, him and his girl friend truly made us feel at home. Their apartment is beautiful and in a great location. Communication was great. Amenities are really nice, they made breakfast for us, they really meat all our needs. I 100% recommend to stay at Michael’s. I know we will definitely be back on our next visit to NC. John is friendly and hospitable. The room is nice and the desk offered me a place to get work done remotely. Great place to crash for myself and a coworker while we were in Charlotte for work. We stayed here for 2.5 weeks and all of our needs were met. would recommend. A great location at a great price! This room is a perfect choice for people traveling through the area solo for things like the local university, racetrack, and the Carolina Renaissance Fair *the fair is a fast 18 minute freeway drive away). It's within a few blocks of food and gas, freeway access, and within 20 minutes of a major mall that has good shops, amusements, and an aquarium. Overall it's basic and clean in a safe neighborhood featuring a hot shower and blackout shades in the room. Easy lighted parking too. John was present on site but not intrusive and was nice enough to let me do some basic meal prep in the kitchen. Non smoking house too! Great stay, comfortable. Great host, thanks John. It was a nice stay! I like the neighborhood, it was really peaceful. John is an awesome host. His home is clean and warm. In a quiet neighborhood, yet very convenient and close to the shopping malls, Walmarts, speedway, and airport. A definite gem find thru Air B&B! It was an easy stay. The place is as advertised. Very nice neighborhood, near the interstate, but in quiet area. Big house, all you need. Easy going host, simple, uncomplicated. High recommend. Billy was quick to respond to my messages and help out when I needed him. This is a perfect location if you need somewhere affordable to stay while in the Charlotte/Concord area. Billy was great at communicating with me. Highly recommended!!! DO NOT get this place! The place is super dirty and he does not answer any of your calls I waited 2 hours for him to let me in. I was so tired and I had to call the support line for them to get ahold of him. The place was not as described and it was like a kids bed I couldn’t even stretch out on it. I couldn’t get ahold of him to leave the keys so I just left them and left. He then answered hours later. I would NOT ever reccomend this place to anyone els... spend more money to get something better!! I had slow responses multiple times and had to deal with a ton of flies while I was there. I inquired about the safety of my belongings and was reassured that they would be safe. However, he didn’t have the key to my room for me to lock it while I was away and because there are other rooms available to stay in, multiple people were responsible to keep the front door locked and it was not often locked which made me concerned for my things. I paid $25 a night and you get what you pay for. I needed just a bed to crash at night and didn’t need things like a tv or a living room. I only needed a bed, a shower, cleanliness and safety and the latter two were not fully realized. This room has a 55" UHD smart TV, a small in-room refrigerator, and an Alexa smart home devices that can be used to control the lights using your voice, ask questions, set alarms, play musics, etc. The neighborhood is located in a very convenient area. There is a neighborhood Walmart and a CVS near by. It is 8 minutes driving distance to Concord Mills, motor speedway, UNCC, the Music pavilion, and 20 Minutes from uptown Charlotte. This is a 4 bed 2.5bath home with new furnitures and smart home devices in every room. I have 3 rooms listed on Airbnb. So don't be surprised if you see other guests in our home. However, making our guests feel safe and comfortable is our priority. Your room has a keypad door lock to keep your belongings safe. If you like to meet new people on your trip, its a perfect place for you. The neighborhood is in a super safe area. You'll see a pool and a big lake when you enter the neighborhood. Our neighbors are nice and we watch out for each other. Ting ting was very accommodating friendly and polite! The place is like a hotel with very private and safe rooms. Very clean and very up to date in a wonderful location! I would definitely come back to this room! Nice , quiet , a great host & the services offered is equivalent to a 4-5star ! Enjoyed my stay ! I had a fantastic stay at Ting Ting's house! The room I stayed in was very comfortable and had everything I needed and more (comfy bed, mini fridge, large tv, an amazon device that could play music). Next time I'm in Charlotte I'll definitely stay here again! Ting Ting was a great host and her house is nice. Recommend to anyone staying in that area. Wonderful hospitality, comfortable and quiet home, with fully equipped kitchen, bathroom, TV, etc. Sparking clean. Fast wi-fi. Perfect location, only 5 minutes away from a Walmart Neighborhood Market, restaurants, shopping and more. Perfect stay, thank you! It's a lovely house for everyone. Ting Ting is a GREAT hostess. I felt comfortable and relax during my stay. This house has a huge tv in the living room and some fitness equipment just near the entrance. The neighborhood is quiet. This is definitely a perfect Airbnb experience for me. Ting Ting's home is very clean and comfortable, and both she and Brandon are very warm and welcoming. Ting Ting has a degree in hospitality management and it shows. She's very dedicated to providing a first class experience, even providing snacks and making breakfast before leaving for classes in the morning. The room is a decent size, with a huge TV, a fridge, and a very comfortable bed. Each of the bedrooms has it's own coded door lock, and the rooms share a very clean bathroom. The location is a quiet treed neighborhood with friendly neighbors, and the home has a large deck where you can drink coffee while listening to the birds. This home is a wonderful place to stay if you're in Charlotte, and you couldn't ask for nicer hosts. Ting Ting's place is really nice, very cozy. This is a truly unique opportunity to stay AT Charlotte Motor Speedway, overlooking Turn 1 and the entire speedway complex! Whether you're in town for a speedway event, to visit Bass Pro Shop/Concord Mills Mall, IKEA, UNCC, PNC Music Pavilion or the many other attractions, there's not a more central location with a more breathtaking view than this! We will set up plush queen air mattresses with sheets, comforter and pillows to make your stay the best! The space will be all yours! This is a wonderful place to stay if you're in the area for any reason! There is always something going on at the speedway and this is a Birdseye view! Whether you're here for Monster Trucks, Drag Racing, The Dirt Track, the Auto Fair, Car Show, or want to stay a few nights during the Christmas light show, you will not be disappointed! Location is close to everything, and access is super easy and very private! As others have noted, the view is absolutely amazing. Even if you aren’t a race fan, you can appreciate the view. The complimentary snacks were tasty and thoughtful. And the accommodations are quite comfortable and cozy. Would recommend this space to anyone. This space is great and the view is amazing. You will not be disapointed. We were completely blown away by this airbnb experience. The space was flawlessly clean, very modern in design, very functional with two bathrooms/showers, kitchen space, and amazing view of Charlotte Motor Speedway. Communication with Matthew made everything very easy. The instructions to locate the complex, retrieving the key, and checking out were perfect. Responses were replied to immediately, you can tell Matthew really cares about satisfying his customers. We accidentally left a pair of boots, and Matthew immediately offered to help get these back to us. It's obvious from the pictures, privacy shouldn't be expected if staying with others in this space, but there is one end with a smoked glass divider (doesn't go all the way to the end of the wall, but blocks off the main space). The provided air mattresses were very comfortable, with auto adjustable pressure based on your selection. There were some complimentary snacks and drinks, which was a very welcoming surprise. We originally picked this space because we had an amateur race at the track, but if I found myself in Charlotte for another reason I would not hesitate to stay here again. We will definitely be back next year. The condo was way above what I expected. The views are unbelievable right when you open the door. They thought of everything right down to the little snacks. Thank you again. This place has to be one of the best AirBnb I stayed in. It’s very spacious to entertain guest. We stayed for NBA All Star weekend, so sleep was at a minimum. The built it speakers made every minute memorable and fun. We will definitely come back to this spot every time we come to Charlotte. We were lucky to see two NASCAR racers practicing early Sat morning. Do not think twice about staying here, just book it and I promise you will love it. When you arrive you will be greatly surprised at how big and luxurious the condo is. There is plenty of room to relax and watch the things going on in the track. There is enough amenities that if you forget something like a toothbrush or shaving cream it is there for you. It is definitely worth every dollar you spend to be here. What a well appointed, clean, unique place! We stayed for two nights during a NHRA weekend, and all guests were blown away with this property! The view is amazing, even though there was no NASCAR race, on both mornings we watched the people who booked a “NASCAR experience” cruise around the track. Everything was super clean, the beds were nice and we all slept well. Highly recommend if you are in the area for events. Stunning Studio Condo @ Charlotte Motor Speedway! Peaceful Serenity is located right off I-85 near Concord Mills Mall, Great Wolf Lounge, Charlotte Motor Speedway, and several of nice restaurants. Peaceful Serenity is a place to relax and unwind. Conveniently located near Concord Mills Mall and Charlotte Motor Speedway. Pictures really don’t do it justice! We walked in the place and were immediately in love with it. The bed was soooo comfy and the big bathtub was definitely a plus! The place Anthony has is all around an amazing place and I will definitely be coming back! Very peaceful and sparkling clean! Very spacious worth the value! Close to shopping, easy access to everything. Would definitely stay again. Excellent place. Nice and quiet, while convenient to where I needed to be. Great place, nice kitchen, cozy bed and washer/dryer inside the unit. Less than a mile from Concord Mills Mall which has plenty do eat, play and see. Only about 6 miles from Charlotte Speedway. Anthony was a great host and always was on top of the communication chain. I loved his place so much, I have already rebooked my next trip! Super clean neighborhood. Anthony is nothing but top quality...... There is some community food her (nor perishable) and some condiments.....I added to this with some small snacks. The place is very clean and quiet. Location cannot be beat for race track and Concord Mills Mall...... Easy in and out......I want to book next 3-6 months on weekends I stay and he makes it smooth. Super touches like clean bathroom, laundry, nice kitchen, supplies and enjoyable and secure living quarters.....Thank you A. Best place to be! Loved everything about the apartment and was near everything. Really enjoyed myself. Schedule your stay in a cozy getaway equipped with a comfortable in- and outdoor space. You’ll want to take advantage of the upscale amenities within the property. Going to a concert? Exploring Charlotte and surrounding areas? Treat yourself to a little relaxation while you’re at it! SCREENED IN PORCH FOR YOUR ENJOYMENT! 10 MINUTES TO ALL YOUR FAVORITE RESTAURANTS AND COFFE SHOPS. Beautiful home in desired Charlotte area. Our guests love that we're about a 15 minute drive from Spectrum Centre and other major attractions and a 2 minute drive from the Motor Speedway' This newly built home is super spacious with an open floor plan and a fireplace. Lightning speed internet connections, Netflix and ROKU already installed. Our home sleeps up to 10 persons so it's great for families and groups and entertaining. Your Charlotte Chateau awaits! This is a gorgeous upscale neighborhood that you are sure to be pleased to come “home” to. Nice home with plenty of space. Quiet neighborhood with parking. MY family and I stayed here during thanksgiving week. We were close to shops and restaurants. Our host was responsive and accomidating. Great all around place. Thank you Kevin ! As described, beautiful home made for a great stay in Charlotte! Great house. Very clean. Just a few suggestions. Bring extra toilet tissue. It’s only one TV in the and thats in the living room. So if you like to lay down and watch tv be mindful there are no Tv’s in the bedrooms. Other than that it was a wonderful stay! Very clean, beautiful neighborhood! Our home is a clean and inviting space that can accommodate up to 2 guests, shared bathroom with 2 sinks & locking doors. If our Room B is rented the bathroom is shared if not the bathroom is to yourself. We live in a quiet neighborhood with easy access to Concord Mills Outlet Mall, the Speedway and the ZMax Drag Strip (3 miles), UNC Charlotte as well as 25 minutes to Uptown Charlotte, and Charlotte Douglas International Airport (25 min). We have many restaurants and places to shop. Our place is in a quiet, safe neighborhood with 2 parking spaces available in the driveway. Heather's family is a sweet, loving little family. My room was spotless, the bed was very comfortable. Plenty of lighting in the space, which I appreciated since I had to work at my computer late into the night. The bathroom was spacious, clean, and plenty of linens and toiletries were provided. I enjoyed the use of the kitchen with their permission. I thoroughly enjoyed sitting in their formal dining room to eat my meals. Kitchen items were clean and high quality. The coffee is outstanding! This family is very friendly and thoughtful, just all-around good people. I would definitely stay there again, especially when I want to go shopping at Concord Mills - it was SO close to the mall, very convenient! Wonderful hosts, beautiful home with modern furnishings and impeccably clean rooms. Come enjoy a spectacular day or night or weekend in my comfty apartment, where you can experience the Queen City in a safe and magical way. Great Spacious House for a Nice Gathering, Amazing Backyard to Enjoy your Company. This House is at the end of the Street with only neighbors on one side, Wooded area on the other! Complete Privacy, Located in a very quite and Safe Community. We do have a In House Chef on Site Upon Request to Serve Southern Style Comfort Food! In Order to get this Additional Service Please Let Us Know Upon Booking Your Reservation So We will have time to Build Your Menus and days you will need Service. One of the best Air BnB’s I’ve ever stayed in. Rented the house to enjoy All Star Weekend with the girls and a few friends. I loved how homey it felt, honestly the best part of the trip. Hosts hospitality put the icing on the cake by preparing a savory breakfast as a welcome gift and I was more than pleased. This home had everything I needed to be comfortable and if I could stay, I would. Excellent communication and fast response. Everything we needed was in the home. This place was fully furnished and very well kept. I’ll be back in Charlotte this summer and will definitely booked this Airbnb again. Thank you Sylvia for being so welcoming, you were the absolute best! Spacious corporate housing convenient to Charlotte, Concord, Huntersville and Lake Norman and University area. 5 bedroom home boasts large rooms with two offices for private space for business. 3 full sized bathrooms. Recently painted, bamboo flooring in most rooms. A huge updated kitchen with stove, refrigerator, microwave and fully equipped. Washer and dryer are included, as well as all utilities. Pets are allowed and yard is enclosed. Open floor plan in a safe, friendly neighborhood. Great neighborhood with fantastic neighbors! Our apartment/father in law suite is close to Family-friendly activities, restaurants and shopping at Concord Mills. We are also close to Charlotte Motor Speedway (3 miles), PNC Music Pavilion, (5 miles), the Concord airport (5miles), Charlotte Douglas Airport (20 miles), Uptown Charlotte (12 miles), UNCC (4 miles), Frank Liske Park, Harrisburg Park and close to I85 and I485. Great place for couples, solo adventurers, business travelers, and families with children. You will have private access to our apartment. It is attached to our home but entirely separate entrance and front porch. You will have a washer/dryer, a well stocked kitchenette, and We are located in a quiet cul-de-sac neighborhood. This charming apartment is close to many attractions including Charlotte Motor Speedway, Concord Mills Outlet Mall, PNC Music Pavilion. Our apartment is in a quiet neighborhood close to Charlotte Motor Speedway, Frank Liske Park, UNCC and PNC Music Pavilion. My family and I spent just one night at Debbie's place arriving late in the evening and leaving in the morning to go to the Carowinds amusement park. Debbie's home was great place to spend the night but I wouldn't mind spending more time there. The place was clean and provided plenty of space for 4 people. The kitchen is a bit smaller and has just a two burner stove, but we didn't even need the stove for our short stay and I don't think we would need more than that while on vacation. There was a nice little desk in the living room which would be helpful if you need to get some work done. Overall we had a good experience and I would stay at Debbie's again. Thank you, Debbie! The apartment was perfect for what we needed. The cutest place. Sugh a sweet laDyson. I'm so happy we chose this place over a hotel. Thank you so much! Great location and very comfortable apartment. Debbie's place is great and Debbie is very responsive to your questions before and during your stay. Cozy Home Away from Home Relax and enjoy!!! Enjoy quiet, clean, comfort in this charming, cozy apartment. We're close to two airports (Concord Regional- 10 min away & Charlotte Douglas 30 min away), parks , shopping, restaurants, and more. We're located at the end of a cul-de-sac with large trees and great streets for walking/biking. The apartment has a comfy bed, and a well-equipped kitchen. We're very accommodating hosts and are usually close by to help you if needed. Parties, pets, smoking/ vaping are not allowed. No cleaning fee! You will have private access to this clean, neat, and beautifully decorated apartment. The apartment is located on a quiet cul-de-sac in a neighborhood that is located close to many great area attractions. You will have access to park one car in the garage under the apartment and will have a garage door opener during your stay. Our neighborhood is located approximately 6 1/2 miles from the Charlotte Motor Speedway and Zmax Race Track. Concord Mills Outlet Mall is located about 4 miles from our home. Downtown Concord (6-7 miles away) has many charming shops, a legendary ice cream shop, a chocolatier, many great restaurants, and several art galleries. Concord offers great shopping, awesome restaurants, coffee shops, bars, parks, etc. There is much to do here. It's a great place to live and visit! Deana's house is in a nice residential neighborhood, very safe and quiet, the apartment is decorated very nice, is spotlessly clean, has ever amenity you would need. Enjoyed our stay very much. Deana was amazing and the apartment was absolutely beautiful and clean! The neighborhood was also beautiful and quiet. It was extremely convenient and affordable to us while in town working a convention and we came and went sometimes not getting back till very late every night which thankfully the apartment did not disturb the rest of the household. :) We are ever so grateful and very much enjoyed our stay!!! We loved our stay here! They were extremely welcoming and the apartment was very nice and clean. This was our favorite Air BnB we have stayed in so far. Highly recommend! Deana was so helpful, I loved and enjoyed her place and hospitality. I will definitely stay again. We loved staying in this sweet apartment. The hosts were very friendly- making sure that we felt comfortable. Everything was exactly as advertised-- the apartment is in a lovely, secluded neighborhood that is very near grocery and shops and is convenient to greater Concord, Charlotte and Harrisburg. With two small children, we were pleased that the apartment had lots of sleeping arrangement possibilities and was particularly family friendly. I can't say enough good things about this place. Would definitely stay here again!!! Very nice and stylish space. If traveling with a travel crib the closet in the bedroom works as a great spare room for the baby, and still privacy for parents. The bed is very comfortable and the apartment is very clean. Grocery store down the street (Publix) and I love it! Deana's place was absolutely perfect. It was private, extremely clean, decorated very nice and was just perfect for my husband and I. She definitely goes above and beyond to make her guests comfortable. Would most definitely stay here again as it has been our best airbnb experience so far! **Utilities, WiFi, Netflix and laundry included** Brand new furniture, very cozy cute little townhouse. Come stay with us and enjoy. 15 min or less from the house: Airport, White Water Center, NASCAR hall of fame, Noda, Carowinds, Premium Outlets, UNCC (6 miles), Charlotte Motor Speed Way, Concord Mills Mall and Bank Of America Stadium. The Billy Graham Library, Spectrum center, and PNC Music Pavilion are also close by. This location is very convenient to 485 and 85. The space for the guest will be a private room and a share bath upstairs. You can access the full kitchen, laundry, living room and dining room. The private room has a queen size bed, There are towels, soap and shampoo provided as well. Would definitely recommend. Quiet, in a safe part of town, comfortable, easy! Adrian is a great host. The house is clean and met ask my needs. Close to most everything. Thank you Adrian? Nice Home. Large Bed. Fire Stick TV. Adequent Closet Space. Carpeted Floors. Adrian is super host. Everything was perfect. I truly appreciate the way he handled the situation when I forgot the keys inside the house and had panicked a lot, but Adrian took care of everything, even though he was out of the country.. I highly highly recommend this place for anyone... best wishes and blessings.. thanks a ton Adrian..
Great place to stay! Clean, comfortable and very affordable! Had such a warm welcoming and very comfortable stay. Best hosts i have ever had! 1500 sq feet Queen bed. Nice mattress. Spectrum TV with Showtime, Amazon & Netflix Welcome to Charlotte. This is a comfortable place to relax and access many different areas of Charlotte. Grab the Lightrail at UNCC to Uptown! Very close to UNC Charlotte, Concord Speedway, Harrisburg. Exit 33 on 485. Modern furniture, spacious apartment, quiet location. Lots of amenities. 20 minutes to Charlotte Douglass Airport. Full access to kitchen, living room, work out facilities, and pool (in season). Clean, roomy, convenient, and most definitely comfortable. This place was great. Checking in and checking out was easy. I would recommend this room to anyone. Michael was the best airbnb host that I’ve ever had. His apartment was easy to find and really clean. The bed was extremely comfortable and the kitchen had everything that I needed. Michael was very nice and even offered me red wine, popcorn and the use of his vertical table! If you want a place that feels like home, look no further. If I could give more than 5 stars, I would! We really enjoyed our stay! The place was clean, tidy and welcoming- and in a really convenient location. We would happily recommended this place to anyone visiting Charlotte. This room has a 55" UHD smart TV, an in-room refrigerator, and an Alexa smart home devices that can be used to control the lights using your voice, ask questions, set alarms, play musics, etc.The house is in a very safe neighborhood right across from Walmart. It is 8 minutes driving distance to Concord Mills, motor speedway, UNCC, the Music pavilion, and 20 Minutes from uptown Charlotte. This is a 4 bed 2.5bath home with new furnitures and smart home devices in every room. I have 2 rooms listed on Airbnb. So don't be surprised if you see other guests in our home. However, making our guests feel safe and comfortable is our priority. Each room has a keypad door lock to keep your belongings safe. If you like to meet new people on your trip, its a perfect place for you. Excellent place to stay. She was really helpful. Place was really clean. Best place to stay in Charlotte. The Place is amazing. She is very professional and has kept the house such that all needs are met. She is extremely communicative. All in all, everything was taken care of and then some more. Ting Ting was very responsive and accommodating. It was easy to check-in and get settled. The neighborhood is quiet and was convenient for me since I was working in the University City area. Very comfy bed, which was much appreciated after a long drive! What a lovely host! It was so nice to meet Ting Ting and Brandon! I was treated like an honored guest. Ting Ting was very helpful and responsive. She prepares a beautiful home with many thoughtful touches and amenities. I couldn't believe the beautiful breakfast I was invited to enjoy! The room and bathroom were very clean and the bed very comfortable. I would definitely stay here again. Ting Ting's place was a wonderful surprise. Very safe and family friendly location and a fantastic property. The HUGE flat screen TV was like being in bed ... at the movies!!! The room is better than any hotel you could find. The host was super friendly, and attentive. She went above and beyond. Highly reccommend!!!! Our home is a clean and inviting space that can accommodate up to 5 guests, private bathroom with 2 sinks & locking doors. We live in a quiet neighborhood with easy access to Concord Mills Outlet Mall, the Speedway, the ZMax Drag Strip, UNC Charlotte as well as 25 minutes to Uptown Charlotte, and 25 minutes to Charlotte Douglas International Airport. On our exit, we have many restaurants and places to shop. Very good rooms and excellent landlord. Beautiful townhome in the University area that's family and dog friendly!! Minutes away from UNCC, Target, restaurants and shopping. Just 15 miles from Charlotte International Airport & Uptown. First floor features an open living room with hardwood floors, a master bedroom as well as a full master bath & walk-in closet. Kitchen has stainless steel appliances & granite countertops. Upstairs includes a bedroom with full bed, a loft that has 2 twin beds and a full bathroom. Close to I-485 & I-85. Eli was very accommodating, his place was roughly 20 minutes from everywhere we planned on going which was a fairly cheap uber for the amount of girls we had. The house was put together and ready for our arrival. We all really enjoyed our stay in Charlotte with the help of allowing us in his home! This was a nice location and clean town house. Our family enjoyed it very much. There was a train that we could hear often, that we had to get used to. Eli was so responsive about our stay. The unit and neighborhood were perfect for our needs and as described. Eli's place was very clean and convenient. The service and responsiveness were awesome and my family enjoyed the place greatly. We plan to use this place again in the future. Great location. Clean, comfortable space! Eli was a wonderful host, and we were very happy with our stay! one of the best. great value - reasonable price for the entire apartment with 3 rooms and complete amenities. we felt so comfortable there. also in a good neighborhood and close to anything you may need. 15-20 minutes to downtown. will definitely book again when I go back to Charlotte! This was a really nice cozy place!! Centralized to local restaurants and stores, Eli was a great host very attentive to our needs. Would come here again if I have too.